I think I’ve used more kitchen gadgets in my first 8 days of the Whole30 than I have in the past 6 months. I love it! And this includes some newly purchased gadgets – especially my spiralizer. It will change your life to be able to make “noodles” out of veggies. 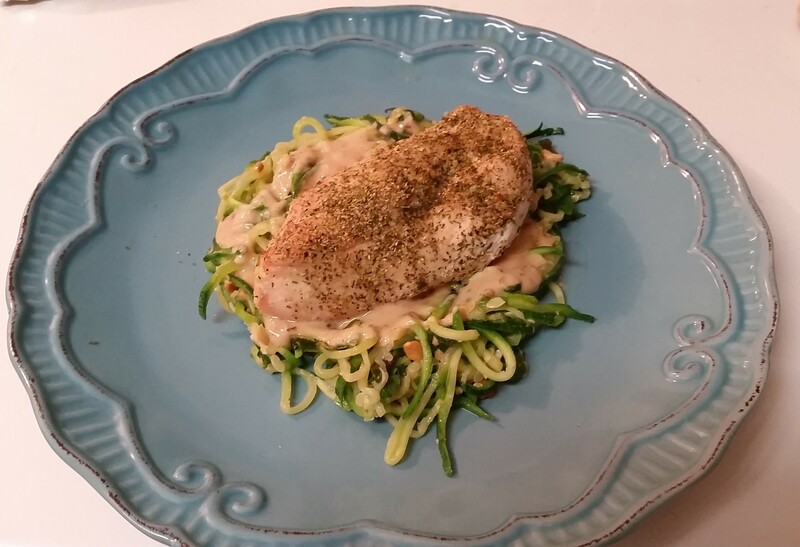 This recipe seemed easy enough (though I’m realizing I think I’m choosing the most prep-heavy recipes – more on that in my week 2 recap) and it made me use my new spiralizer! It really was not difficult, just a little time-consuming with lots of chopping, spiralizing (I’m making it a word), and cooking. So although it probably won’t be a regular in my food rotation, it was good! I just baked a piece of chicken with Mural of Flavor seasoning. If you still haven’t made it to Penzey’s – try to check it out if you have one near you! Or order this spice mix to try because it is very versatile. This can also be used as a side, which I did later in the week with the little bit I had leftover! Before anything else, go ahead and prep: spiral zucchini, chop green onion, crush cashews, and tear cilantro. Combine cashew butter, coconut milk, rice wine vinegar, red pepper flakes, granulated garlic, and salt in a small saucepan. Heat on low to combine and make a sauce. I ended up adding probably up to 1/2 C water because I thought the sauce was too thick. While sauce is warming, saute zoodles and green onion in ghee or olive oil. I had to split them between two pans and it took a while. You could do in smaller batches to saute quicker. Add torn cilantro and chopped cashews to zoodles and saute for 1-2 minutes. When zoodles are cooked, add sauce to the pan and mix to combine OR portion individually with a dollop of sauce on zoodles. I portioned and dolloped. Garnish with chopped cashews, cilantro, a drizzle of sesame oil, and red pepper flakes if you want. I drizzled sesame oil but did not garnish with anything else. I thought the sauce had enough kick of red pepper flakes and my “garnish” was my chicken breast! Categories: Spirited Saturday, Whole30 | Tags: cooking, food, Whole30 | Permalink. I eat a lot of soup in the winter, so I was glad to find some recipes that were Whole30 approved. I found this one on Stupid Easy Paleo (I love the name)! Now, I love cooking, but I kind of dislike a ton of prep for said cooking. Therefore, I do not use butternut squash much. It’s a huge pain to cut and peel. There’s probably a better way to do it than I have done, but I highly recommend buying it pre-peeled and cubed if possible (sometimes Trader Joes has it). Other than that, this is a really easy recipe! Roast the butternut squash and carrots. Combine it with everything else in a large pot and puree it. I used my new immersion blender which is the best appliance ever! Serve hot whatever side you want! One night I did a baked sweet potato. One night a small baked chicken breast for some more protein! You can also add some cooked protein into the soup. Enjoy! Peel and cube the squash, removing the seeds. Do the same with the carrots. Place on baking sheet, drizzle with oil, and sprinkle with salt and pepper. Bake for at least 20 minutes or until the veggies are soft and lightly brown around the edges. Remove from oven and put in a large pot. Add the rest of the ingredients: chicken stock, coconut milk, cumin, cinnamon. Puree the soup until smooth. If using a blender, you’ll probably have to do at least two batches. Adjust seasoning with salt and pepper. Categories: Whole30, Wonderful Wednesday | Tags: cooking, food, soup, Whole30 | Permalink. Week one down!! And let me tell you, I feel great! Mostly it’s just mentally feeling great about what I am eating or, really, not eating. I haven’t really been tempted by anything. I’m not going to lie, my Day 1 was ROUGH. But I was also going back to work after being off for 2 weeks, so the combination was not the best. I got a headache that only got worse throughout the day and I got in bed at 8pm. But it could only be better after that, right?! And it did! Obviously your body has to adjust. My energy was a little low starting my Whole30, but even after just a few days I could already tell it was getting back to normal, and I mostly noticed a difference during my workouts. As I said initially, I was keeping it simple the first week. So I had the same thing for breakfast and lunch every weekday – which is what I normally do anyway. Other factors I had to consider: 1) I eat breakfast at work, so I needed something I could make or heat there and 2) our kitchen at work is tiny, so it’s best to quickly get your lunch together or else there’s literally a traffic jam in there. 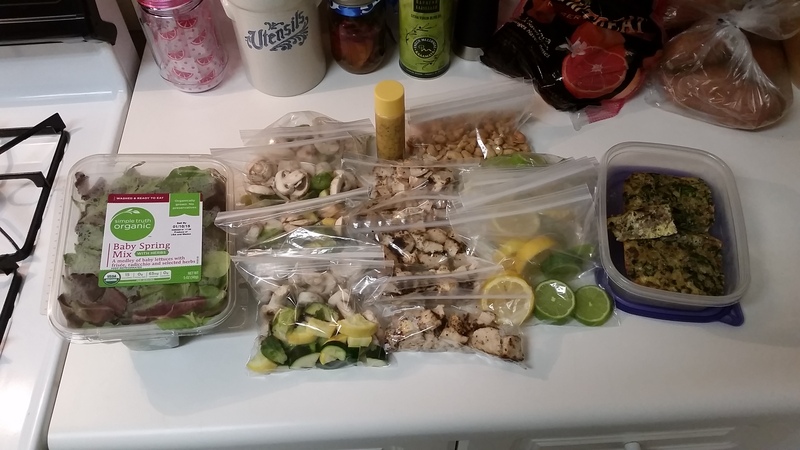 So I spent about 3-4 hours on Sunday prepping. Every now and then I had a small handful of cashews if I got hungry in between meals, but I don’t really love raw nuts, so I haven’t found the best snack option yet. Typically I try to not snack, so this wasn’t something I considered from the start. I also had to sneak a couple Lara Bars in when I got desperate a couple days. I’m really enjoying the Whole30 so far! I even made it through a partay Friday night and just sipped on a La Croix! 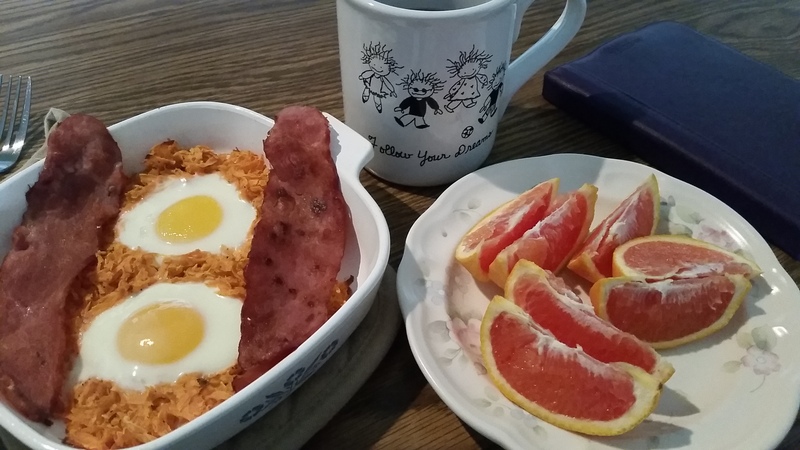 Weekday Breakfasts: Egg, sausage, spinach casserole + piece of fruit + black coffee. Technically the sausage is not Whole30 approved – there is a tinsy bit of sugar added. It’s just impossible to find. I won’t eat it every single day though. It was good – nothing special really but it was filling and tasty! Also really easy to heat up. Weekday Lunches: Salad w/ grilled chicken, zucchini, squash, brussel sprouts, avacado, blackberries & orange poppyseed dressing (yum). I grilled (on a grill pan) a bunch of chicken on Sunday seasoned with Penzeys Mural of Flavor, cut it up into pieces and portioned it out between 5 snack-size Ziploc bags. I steamed the veggies slightly – but you definitely don’t have to – and also portioned them into Ziploc bags. (If you have not discovered Ziploc Steam Bags – they will change you life.) The seasoning on the chicken paired perfectly with the dressing. Dinner: baked salmon + sweet potatoes + broccoli. 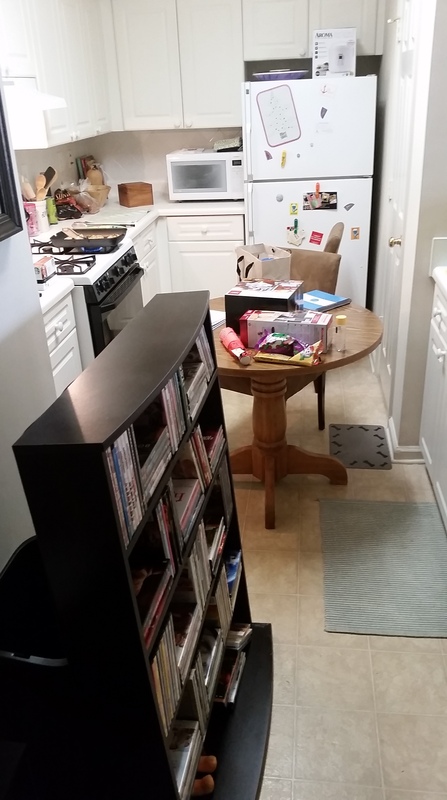 My kitchen was not back to normal until mid-week, so the first couple of days needed to be super simple. I baked salmon seasoned, again, with Mural of Flavor (seriously amazing on so many things), steamed some frozen broccoli, and steamed a cubed sweet potato! Nothing special, but it was good! 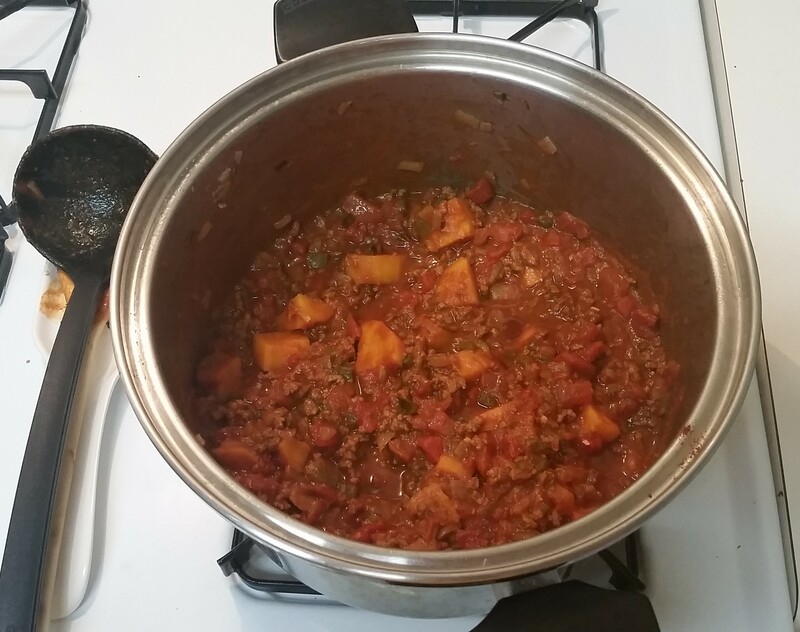 Dinner: beef & sweet potato chili. I cannot express how delicious this was. I’ve already posted it, so check it out! Weekend Breakfast: sweet potato hash w/ egg + turkey bacon + fruit. Megoir’s look way more delicious than mine – I’ll have to perfect this. Weekend Dinner: spiced butternut squash soup. I’ll post this recipe this week – so good, but not so easy. One night I had a side of sweet potato, one night a small piece of baked chicken. I need to be better about lunch on the weekends, but I usually eat a later breakfast and am out and about in the middle of the day. So there was more Lara Bar cheating and small handfuls of cashews than planned. I’m only a few days into my first Whole 30 and I have already learned a lot. I thought I’d go ahead and share some initial thoughts and tips. These may change as I go along, but I’ll definitely update them if/when they do! Prep, prep, prep. This is seriously the best thing you can do before beginning the whole 30. Read the website, join and read/search the forum on the website, talk to people you know who have done it before. I did not read the book as I am trying to save as much money as possible. I’m sure it’s very useful and informative, but I think it’s possible to do without. Start on a Monday so you can use the weekend to find/print recipes, make a grocery list and shop, rearrange your pantry/fridge, get rid of or move the foods you can’t have for the 30 days. And use your Sunday to go ahead and prep some food. I’ll share more details about my exact food prep later. The bottom line: having a plan and being prepared will make this easier and give you less reason to quit! Organic. One of the main tenants of the Whole 30 is that your food be organic, grass-fed, pastured, sustainable, etc. This can get very expensive and as I said earlier, I am in super saver mode. So I am not going this far. For meats, I am making sure to remove all the fat. Some veggies – spinach, kale, salad – I usually buy organic anyway. They also have a great list that tells you which fruits and veggies are best to buy organic and which ones don’t really matter. Meats. It is impossible to find bacon and sausage without added sugar (which is the only kind that is Whole30 approved). I have easy access to health food markets and I still couldn’t find it. So I’m cheating a little in that respect, but am eating it in limited amounts – mainly to get some more protein in breakfast easily during the week other than just eggs. I am fully expecting to see similar results eating non-organic meats (and some with a tiny bit of sugar), veggies, and fruits. But I’ll let ‘ya know! Accountability: this can come in many forms but is very important. Even if you don’t know someone doing it at the same as you, connect with someone who has done it before – whether that be a friend, coworker, or forum online. This way you will not feel alone and you’ll know that the things you’re feeling and ‘symptoms’ you’re experiencing are probably completely normal! That’s all I have for now. I’ll give you an update of food/recipes and how I’m feeling at the end of week 1! Categories: Whole30, Wonderful Wednesday | Tags: food, Whole30 | Permalink.